I'm done playing. That part of camp ended with the two games yesterday. Today, we got to be spectators for the championship game. It was a beautiful morning in Scottsdale, clear and warm. This was the first time this week that there had been more than a handful of spectators in the stands, and campers trickled in over the first few innings. The game was good and the level of play was, well, improving! It's not like you are going to take a whole bunch of 40-70 year olds and improve lifetimes of bad habits in a week. But when you are playing in the championship game everybody steps it up a bit and the familiarity you have with your teammates enhances the level of play. The game was just what you want from a championship game, close right to the end. If you remember my blog entry from last year about the injury to Danielle, you'll be happy to know she was there. 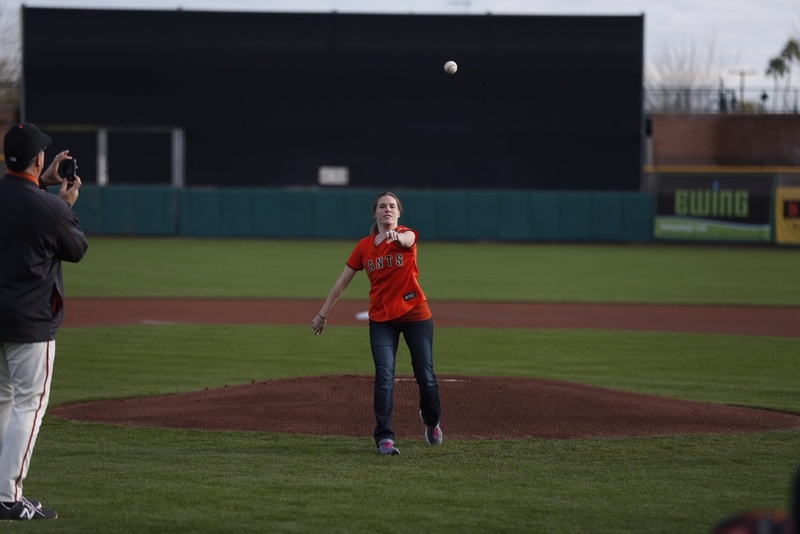 In fact, she got to throw out the first pitch. She is fully recovered and, yes, married! I took a look at the winning team's team picture at the start of camp and again during the awards ceremony. It's a great example of the bond that forms between teammates. In the first picture, you don't see anybody touching anyone else. In the second picture, you would be hard pressed to find two players who aren't hugging or slinging their arm around someone's shoulder! In the afternoon, the campers got to try to get a hit off the pros. Shawn Estes was the first pitcher and I don't think anyone touched a pitch. I was standing behind home plate watching the movement on the ball and it was incredible. The pros ended with Joel Youngblood on the mound (not a former pitcher) and the campers did start to have a little more success. But with the infield occupied by other pros and the batboys in the outfield, only a few of the hits resulted in a baserunner. This camp is a bit like a drug. After my rookie year I said that I had fun, but wouldn't be back. But here I am. My desire to experience the camp as a veteran led me here this year. Now, I'm already making plans for next year. I'm not sure that I know how to stop. My second year was much better than my first for many reasons. The lack of unknowns was a big reason. I knew what was coming and I felt much more comfortable. But my body also performed better. I'm a little sore, but that's all. When I look back at my blog posts from last year, I was so sore on Thursday that I almost couldn't walk. This year, I got a little sore after two games on Friday, but woke up Saturday morning feeling great. I did wake up Sunday morning with the start of a cold, but I think that's just good timing. I can't say enough good things about Bill Laskey and how well he runs this camp. This camp has a reputation as the best camp in the country and that's largely due to Bill. He sets the tone, and his attention to detail is impeccable. There are so few things to improve that I struggle to think of any. Last year, I reflected a bit on my motivations for coming to camp. My feelings haven't changed much from a year ago, but I do have a better appreciation for the friendships that form at camp. I imagine that people who have been at this for 5 or 10 years feel this even stronger. "Baseball is a great game that connects generations," said Marty Lurie. I would add, that it also connects us to strangers, co-workers, and even to our own youth. It's just a game. But it is also so much more.